Less than two weeks after unanimously voting to be on the right side of history, late Wednesday night Lansing, Michigan’s city council reconvened to reverse their vote echoing an executive order by mayor Virg Bernero upon the demand of the local Lansing Regional Chamber of Commerce, as well as the Michigan Chamber of Commerce. To the shock of everyone with a soul and a conscience, several city counselors have caved to xenophobic business interests to defy their own vote, as well as the predominant will of the people. The Chamber via email cited “concern” that our president would punish sanctuary cities by withholding federal funding. But anyone with a brain knows this is an empty threat. Trump’s already DOA budget is going nowhere with funding missing for local jurisdictions. Congressional reps will never vote for a budget that will punish their districts. Threats to cut federal aid to city law enforcement made by Attorney General Jeff Sessions have also been debuffed as meritless. Their red herring falls even flatter when you look at the projects the Chamber has rejected that would bring more federal money to mid-Michigan. The Lansing Chamber actually opposes a much needed Bus Rapid Transit project despite every planner and ‘smart growth’ advocate knowing how successful a tool BRT is for development and transportation, as well being a necessity for poor communities and people of color. When interviewed by PBS affiliate WKAR, chamber stooges Tim Daman and Joe Ford failed to cite a single coherent reason for their opposition to BRT. It’s clear on both fronts that the chamber tried concealing their very real racism inside some very hollow budgetary concerns. It’s no secret that as the nation’s largest corporate lobbying group, the US Chamber of Commerce and by proxy their local chapters represent big business. That means coal, the health insurance industry, Big Pharma, Big Agri-business, and weapons manufacturers all have a seat at Chamber’s table while small biz owners get shut out. On numerous Facebook posts by the progressive alt-weekly City Pulse, chamber apologists posted the usual racist dog-whistle remarks you’d expect about immigrants being ‘criminals’, stealing jobs, and needing to be targeted by “law and order”. Who knew right-wingers were suddenly such fans of Big Government? To their credit, Lansing City Pulse has been steadfast in reporting this as a moral issue. To be sure, Sanctuary Cities are at their core an anti-police profiling measure. Immigrants arrested for felonies will obviously have their statuses checked, everyone already knows that. What the Sanctuary City status does is prevents police from targeting members of ethnic groups solely for the purposes of identifying their immigration status. Officers from Lansing PD have testified their support of the capital remaining a Sanctuary City, rightfully claiming immigrant communities are often scared to report real crime for fear of being caught up in a deportation dragnet. LPD has stated they want immigrants to feel they can trust the police, for right or wrong. But the chamber’s regressive agenda goes even deeper than immigration or public transit. 350.org estimated 94% of the US Chamber’s financial contributions went to candidates who openly deny carbon-caused climate change. As anyone with an understanding of climate justice knows, climate change will overwhelmingly impact the global South, creating potentially tens of millions more migrants and refugees. 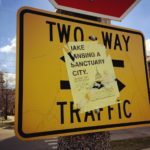 The mayor’s executive order may have the teeth to actually protect undocumented residents long term, but in choosing to let the Lansing Chamber bully them into reversing their sanctuary vote, city council has errored on the wrong side of history. It’s a decision they may grow to regret, and one the Chamber should be made to feel pain for as well. Businesses pushing racist agendas won’t be able to hide behind umbrella groups much longer. Should City Driving Be Considered Terrorism? Ultimately the issue is that in order to enter a country, you should get permission. You can’t just walk into a country without notifying the local government. Every nation has a right to decide how many immigrants they wish to accept. Crossing the border illegally or overstaying a visa is wrong. I don’t understand why anyone would think that it is okay to come into a country illegally and then be expected to be allowed to remain.